This landslide is part of the 1961 USGS publication Landslides along the Columbia River valley, northeastern Washington. 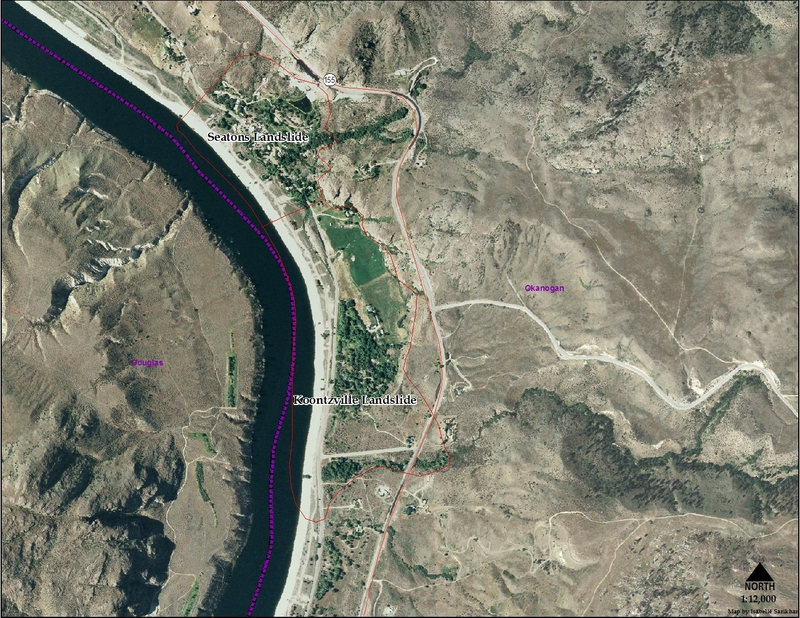 In contrast to the diminishing rate of movement observed in the Seaton slide since 1948, the Koontzville slide seemed to move more and at more frequent intervals in successive years to and including the spring of 1953. 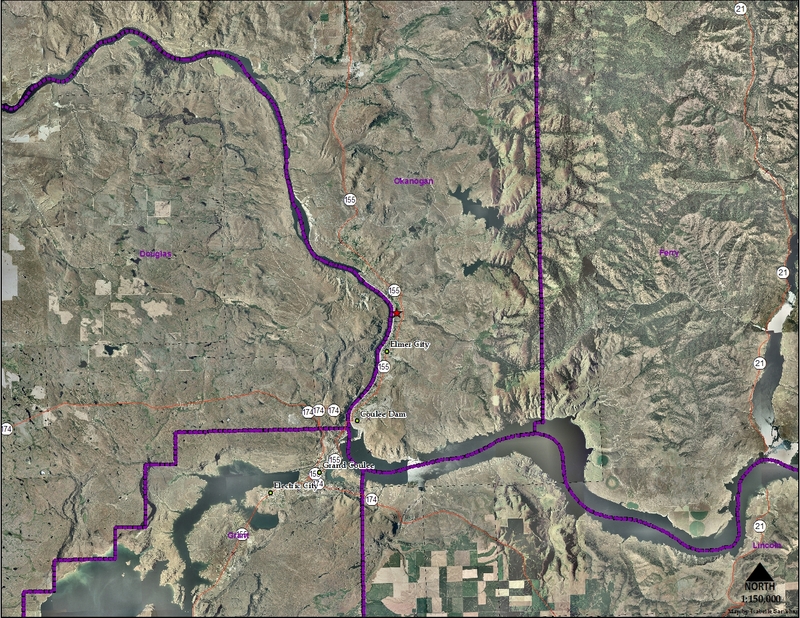 Local residents have noticed that their houses cracked and moved each weekend during low stages of the Columbia River, which corresponded to drops in river level due to power operations at Grand Coulee Dam. Many houses and the store have been severely damaged, the springs have changed their courses, large fissures have crossed the village area, and each year the slide has worked farther back into the hillside. In 1952, a fissure connected the Koontzville slide with the Seaton slide along the silt-granite contact (fig. 20). The displacement in 1955 extended all along the bedrock outcrops between Seatons Grove and Koontzville. Vertical movement along this bedrock scarp ranges from a few inches to 5 feet. Before the 1948 movement there was a light-colored zone on the granite immediately above the contact with the surficial deposits which ranged in width from 0 to 15 feet. Above this zone, all the granite wall is much darker due to weathering and organic growths. This light-colored zone may represent the amount these slides moved down following an earlier Columbia River flood such as the one in 1896. 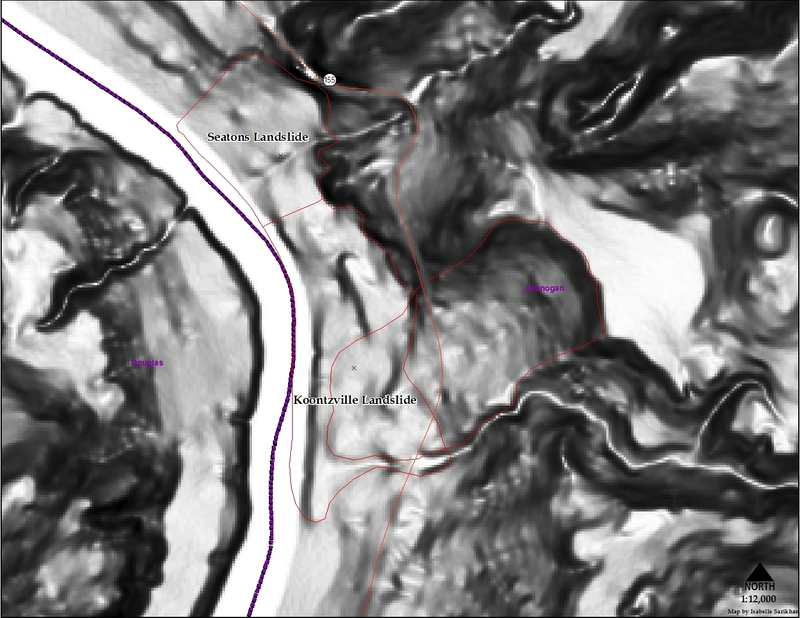 Geologically, Koontzville is in a setting where the sequence of Pleistocene deposits is the most favorable for landsliding. A preglacial channel of Peter Dan Creek underlies Koontzville and because of this geologic setting ground-water conditions are very high. 1. The unusually heavy rainfall during the spring and summer of 1948. 2. The high water in the Columbia River during the flood of May and June, 1948, undoubtedly resulted in a higher water table throughout the entire slide area. 3. The flood eroded and unloaded the toe of the slide, which is on the outside of a bend in the river where erosion would be greatest. 4. Melt water from the heavy snowfall in the winter of 1948 and 1949 kept the slide lubricated and moving after sliding began. 5. Very deep freezing in the winter of 1948 and 1949 may have had some effect in extending old slide cracks and in damming ground water. 6. Seatons Lake was created in a key position at the head of the ancient slide so that it kept much of the lower part of the ground saturated. Springs on the lower slopes of the hill produced more water when the level of Seatons Lake was higher, and the lake surface was raised purposely at times to make the springs at lower altitudes flow at a greater rate for irrigation. 7. The material at the toe of the slide consisted of silt J and clay thinly mantled with sand, gravel, and boulders. Silt and clay could be observed pushing through the gravels at several places along the toe of the slide. Since the construction of Grand Coulee Dam, a replacement supply of sand and gravel to cover and protect the silt and clay from erosion had been largely cut off. Looking at the 10m DEM, it looks like they missed a rather large earthflow that came down. Although this probably didn’t play much of a role in the Koontzville movement in the 1950’s, except for the overall instability in the area. Finding information on this landslide has been difficult. I would only assume it has mostly stabilized out, as houses still dot the landscape. 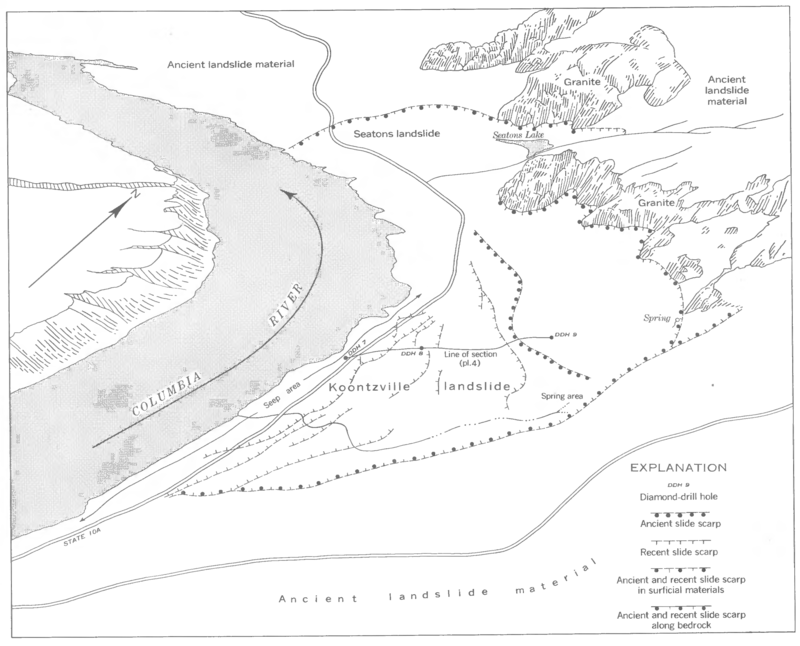 Jones, Fred Oscar; Embody, Daniel R.; Peterson, Warren Lee, 1961, Landslides along the Columbia River valley, northeastern Washington: U.S. Geological Survey Professional Paper 367, 98 p., 6 plates.